Nearly every modern nation must obtain and refine oil to ensure its economic viability, and North Korea is no exception. However, the country’s lack of significant proven oil reserves has forced it to import all of its crude oil and many of its finished petroleum products, while relying largely on coal and hydropower for energy. As a result, North Korea’s petroleum infrastructure remains rudimentary in design and capability. 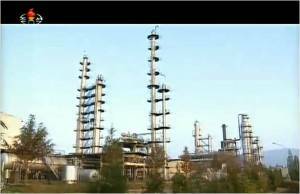 North Korea presently runs only one of its two primary oil refineries, giving the single operational refinery a critical role in the nation’s economy and defense. That site, called the Ponghwa Chemical Factory, was built with Chinese support and reportedly uses imported crude to produce refined oil products for North Korea’s government, military, transportation, agricultural and fishing sectors. The factory is also one of the country’s leading petrochemical research institutions, a distinction that places it alongside the Namhung Youth Chemical Complex and the Hungnam Fertilizer Complex. The achievements of these facilities are reflected in published notifications of awards, academic papers and reports by its scientists and researchers. Such documentation indicates that the staff of the Ponghwa Chemical Factory is actively conducting practical studies of a wide range of petroleum products and production technologies, likely in cooperation with the Petrochemical and Methanol Institute of the State Academy of Science. Figure 1. Production Area of the Ponghwa Chemical Factory, December 12, 2011. All three of North Korea’s leaders have regularly visited the Ponghwa Chemical Factory, committed significant financial resources to its maintenance and development, and publicly emphasized its economic importance. Estimates of the Ponghwa Chemical Factory’s maximum output capacity have increased over the years, but the refinery’s actual output has varied due to a number of factors, most notably fluctuations in North Korea’s access to crude oil. Unconfirmed media reports from 2014 and 2015 assert that China, the North’s largest supplier, sold no crude to North Korea last year, perhaps a reflection of the downturn in relations between the two countries. This reported development, if accurate, would have a serious impact on activity at the refinery, possibly forcing Pyongyang to suspend production at the site, and have negative ramifications for the North’s economy as a whole. 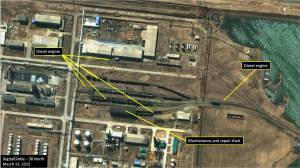 Commercial satellite imagery from 2014 and 2015, however, calls into question those reports and reveals that the facility has remained operational though perhaps at somewhat lower levels than in the immediately preceding years. Imagery indicates both rail activity (e.g. movement of rail tank cars and diesel engines) at the factory’s rail loading/unloading facility, the Sojung-ni Storage Facility and the Paengma-ri Rail Station. In addition, construction within the factory—for example, the building and maintenance of storage tanks and additions to several buildings—provides another indication that the facility remained operational. China’s support for the Ponghwa Chemical Factory dates back to a preparatory building phase in early 1970, when work commenced on a separate plant to provide electricity for constructing and operating the future North Korean refinery. Beijing provided financial and technical assistance to build the Chongchon-gang thermoelectric power plant, which switched on its first generator in December 1976 and three additional generators the following year. resulting in a total generating capacity of 200,000 kilowatts. North Korea and China collaborated from 1974 to January 1976 to build the “PRC-DPRK Friendship Oil Pipeline,” which linked the refinery site to petroleum products storage facilities in China’s Dandong region. The project reportedly consisted of two pipelines, one to supply Chinese crude oil to the Ponghwa Chemical Factory and another to deliver naphtha and other petroleum products. 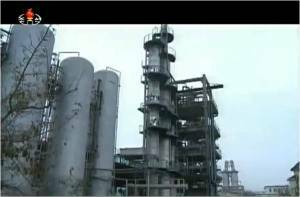 Construction of the refinery, which was initially called the Paengma-ri Chemical Factory, began in 1976 and also progressed with China’s help. During a May 1978 visit to Pyongyang, Chinese Premier Hua Guofeng (Su Zhu) unveiled a new name for the facility—the Ponghwa Chemical Factory—and announced plans to expand the site in a new phase of construction. The facility launched that September and activated a second production process line in 1980. 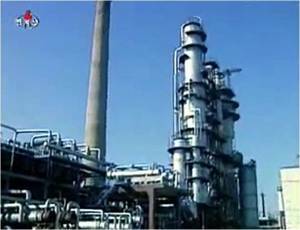 North Korea’s reliance on Chinese oil assistance grew further after its first primary oil refinery, the Sungni Chemical Plant, closed its doors in late 1995. 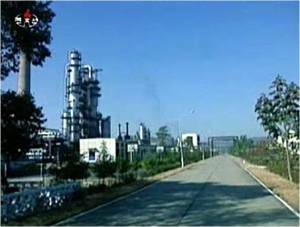 The Soviet Union had built the Sungni plant in Unggi (now Sonbong) during the early 1970s, but the former Soviet Union began demanding market-value cash payments for crude petroleum. 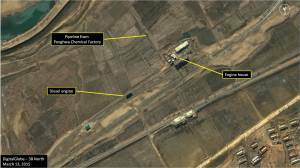 The Sungni Chemical Plant’s closure boosted North Korea’s reliance on the crude oil that China continued to offer at “friendship” pricing, and further raised the Ponghwa Chemical Factory’s already critical importance to the North’s economy and security. Beijing’s key role in supporting the factory became even clearer in August 1995, when flooding reportedly washed away part of the PRC-DPRK Friendship Oil Pipeline and halted deliveries along the route for at least two months. The suspension compromised the Ponghwa Chemical Factory’s access to Chinese crude, causing production to plummet in spite of the site’s use of unrefined oil from stored reserves and rail deliveries. The factory could send and receive oil from its own rail facilities, but primarily obtained crude from the Sojung-ni Storage Facility, a transshipment site receiving crude from China through the PRC-DPRK Friendship Oil Pipeline. 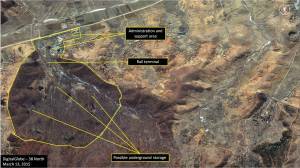 The Ponghwa Chemical Factory also used a rail-linked storage facility near the village of Samha-dong, 3.1 kilometers northeast of the refinery. The dive in output exacerbated the Arduous March, an ongoing food shortage and economic crisis that had resulted from the Soviet Union’s 1991 collapse and the subsequent loss of economic aid, coupled with droughts, floods, famine and unsound economic policies. The production drop at the Ponghwa Chemical Factory also likely contributed to a significant decline in Korean People’s Army (KPA) operations and annual training exercises as pipeline repairs took place. 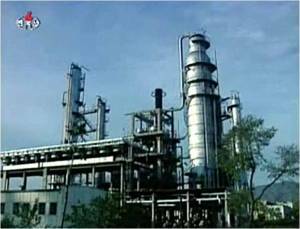 As the Arduous March and economic crisis began to ease in the late 1990s, though, North Korea initiated a number of upgrades to the Ponghwa Chemical Factory as part of a broader effort to expand and modernize critical industrial assets. Upgrades were also made to other facilities deemed to be the nation’s most essential chemical complexes, including the Namhung Youth Chemical Complex and the Hungnam Fertilizer Complex. In one set of projects that extended into the early 2000s, researchers and technicians introduced computers into the factory’s management and production processes. The country made more modifications from 2006 to 2009, including the construction of a new riser reactor for catalytic cracking and the removal of several underground storage bunkers at the Sojung-ni Storage Facility. Separate infrastructure improvements included a major 2008 upgrade to the Paengma-ri Rail Line, a roughly 45-kilometer stretch of track that branches off from the main Sinuiju-Pyongyang Rail Line at Soeha-ri and passes through Paengma-ri and Pihyon-op before reconnecting at Yomju-up. By laying concrete rail ties and replacing worn tracks, North Korea improved the line’s ability to carry raw materials and the Ponghwa Chemical Factory’s petroleum products to and from military factories along the train route, such as the Yangchaek Bearing Plant. Estimates of the Ponghwa Chemical Factory’s “maximum output” have increased over the years, but there are no readily available reliable figures for the refinery’s production at present. Moreover, no credible estimates are available for the refinery’s actual production, either in the past or at present. Physical and political factors, such as North Korea’s access to imported crude, have undoubtedly caused the site’s actual output to fluctuate dramatically. Estimates also are not readily available for actual materials in storage at the refinery, but satellite imagery points to developments in the facility’s maximum storage capabilities. The number of visible storage tanks at the factory and the Sojung-ni Storage Facility has more than doubled since the mid-1980s, when they possessed roughly 80 above-ground containers. Their count of visible storage tanks stood at approximately 200 in 2015, suggesting a significant increase in the refinery’s maximum output capacity and the diversity of its finished products. 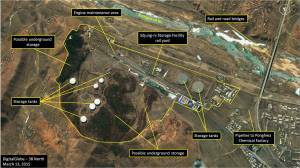 In addition, the Sojung-ni and Samha-dong facilities each possess an unknown quantity of underground storage components that are invisible to satellites. The Ponghwa Chemical Factory, the Sojung-ni Storage Facility (also called the Paengma-ri Petroleum Production Storage Facility) and the Samha-dong Storage Facility are centered on the village of Paengma-ri, Pyongan-bukto (North Pyongan Province), approximately 13 kilometers east-southeast of Sinuiju. Figure 2. Overview of the Ponghwa Chemical Factory. Ponghwa Chemical Factory: Located along the northern bank of the Samgyo-chon (Samgyo Stream) the Ponghwa Chemical Factory occupies an area of approximately 1.25 square kilometers and can functionally be subdivided into four broad areas: administrative and support; production; crude oil and finished products storage; and rail loading/unloading facilities. 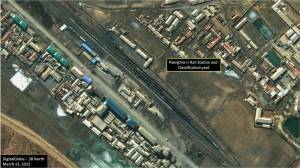 Activity seen in recent satellite imagery of the entrance, rail loading/unloading facility and around the factory includes indications of an operational facility. Figure 3. 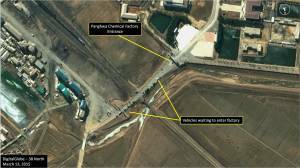 The Ponghwa Chemical Factory, March 13, 2015. Figure 4. Close-up of the entrance to the Ponghwa Chemical Factory, March 13, 2015. The administrative and support area occupies the northeast corner of the facility on either side of the entrance. Aside from the typical administrative and cultural buildings, there is a small farm and livestock facility, a clinic, a cultural facility, a school, several dorm-style housing buildings, research labs and workshops, a maintenance/motor pool area, a football pitch, a leadership memorial and a number of miscellaneous support buildings. The production facilities on the southern side of the factory occupy approximately one-fourth of the refinery’s total area and reportedly consist of production processes for gasoline, diesel, kerosene, naphtha and probably several other petroleum products. The crude oil and finished products storage area occupies the center of the facility and consists of approximately 134 storage tanks. Crude oil is transferred by pipeline from the storage and transshipment facility at Sojung-ni to a small number of tanks in the storage area. Although not the normal procedure, crude oil can also be received at the factory by rail through its loading/unloading facility. From the storage tanks, crude oil is fed into the various production processes. Finished products from the production processes are then pumped into separate storage tanks. From these tanks, finished products are piped to the rail loading/unloading facility or loaded on tanker trucks for delivery to national and regional storage facilities. The rail loading/unloading facility consists of an eight-track stub yard with five loading/unloading tracks, one switching track and two maintenance/repair tracks and a small engine house/repair shop. The facility is switched by dedicated diesel engines that are maintained at the engine house outside the western perimeter of the factory. This facility receives diesel fuel directly from the factory via a small pipeline. Recent satellite imagery shows approximately 69 rail tank cars and a diesel engine engaged in switching rail cars at the loading/unloading facility and a diesel engine at the engine house. Figure 5. Close-up of the factory rail loading/unloading facility, March 13, 2015. Figure 6. Close up of the engine house, March 13, 2015. Incoming and outgoing rail tank cars from the Ponghwa Chemical Factory, Sojung-ni Storage Facility and Samha-dong Storage Facility are all switched through the Paengma-ri Rail Station and its associated classification yard immediately outside the factory’s main entrance. Figure 7. Close-up of the Paengma-ri Rail Station, March 13, 2015. Short spur lines from the Paengma-ri Rail Station feed the Sojung-ni and Samha-dong storage facilities. This station also provides for bulk shipment of dry goods to the factory and provides passenger service for the area. Recent satellite imagery shows approximately 86 tank cars, four gondolas, three engines, one flatcar and one box or passenger car present. Housing for workers and local farmers is located around the factory and rail station. Figure 8. Production Area of Ponghwa Chemical Factory, December 14, 2011. Figure 9. Control Room at Ponghwa Chemical Factory, December 14, 2011. Figure 10. Production Area of Ponghwa Chemical Factory, December 14, 2011. Figure 11. Production Area of Ponghwa Chemical Factory, December 14, 2011. Figure 12. Production Area of Ponghwa Chemical Factory, November 29, 2013. Figure 13. Production Area of Ponghwa Chemical Factory, December 23, 2013. Sojung-ni Storage Facility (Paengma-ri Petroleum Production Storage Facility): Located 1.5 kilometers southeast of the Paengma-ri Rail Station, the Sojung-ni Storage Facility occupies approximately .71 square kilometers and consists of a five-track stub rail yard with a loading/unloading facility and diesel servicing area, a crude oil transfer facility, administrative and support areas and two crude oil storage tank areas. Adjacent to the loading/unloading facility is a storage area with two 83-meter storage tanks. The hill east of the loading/unloading facility is the location of a second storage facility, consisting of 20 above ground storage tanks. Historically, this facility has also housed a number of underground bunkers, each of which contained 10 small storage tanks. It is currently not possible to determine whether these facilities still exist or in what quantity; however, the road network and activity within the facility over the past 10 years suggests that at least some of these containers are still present. Recent satellite imagery shows approximately 13 rail tank cars present. Crude oil from China reportedly arrives first at the Sojung-ni Storage Facility, and is then transferred via pipeline to the Ponghwa Chemical Factory and other chemical factories, or to storage facilities by rail and tanker trucks. Figure 14. Sojung-ni Storage Facility, March 13, 2015. Figure 15. 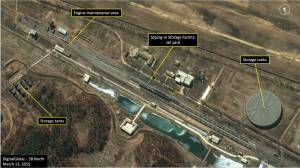 Close up of the Sojung-ni Storage Facility, March 13, 2015. Samha-dong Storage Facility: Located 2.7 kilometers northeast of the Paengma-ri Rail Station, the Samha-dong Storage Facility occupies 0.6 square kilometers and consists of a two-track stub rail yard. Given its layout, direct rail connection to the Paengma-ri Rail Station, and proximity to the Ponghwa Chemical Factory and Sojung-ni Storage Facility, this is likely an underground storage facility for either crude oil or finished petroleum products. While this facility appears operational, there is no readily available information concerning the number of underground storage tanks it may contain. Figure 16. Samha-dong Storage Facility, March 13, 2015. Figure 17. Close-up of the Samha-dong Storage Facility, March 13, 2015. A defector Ko Chong Song reports that administrative responsibility for the distribution of finished products from the Ponghwa Chemical Factory is handled by the Second Economic Committee through a “Specialty Material Branch” located at the factory. This responsibility, however, may have subsequently passed to the Natural Resources Department of the National Defense Commission. Physical distribution is controlled by a “supply center” through a “supply point” at the Ponghwa Chemical Factory. Distribution of finished petroleum products from the Ponghwa Chemical Factory “supply point” occurs by both rail cars through the Paengma-ri Rail Station using the refinery’s spur line and tanker trucks through a loading facility within the factory. Products are then systematically distributed to “supply centers” in what appears to be five distinct prioritized streams: Kim Jong Un “reserves” (for use by Kim Jong Un and the senior leadership); Korean People’s Army (including the Navy, Air Force and the Strategic Forces); factories controlled by the Second Economic Committee; fishing and transportation sectors; and regional and local governments. Some larger, or more important, industries and military facilities appear to receive shipments by rail directly from the Ponghwa Chemical Factory. These shipments are then either stored locally in the railcars until needed or transferred to local storage facilities for distribution via local “supply points.” There are in excess of 150 known petroleum products storage facilities distributed throughout North Korea. This dispersed network of storage and distribution facilities—many of them located underground—is the result of experiences gained during the Fatherland Liberation War (i.e., Korean War) and the Four Military Lines policy of the 1960s, which called for the fortification of the nation. North Korea’s lack of significant proven crude oil reserves has forced the nation to import all of its unrefined petroleum. The nation’s access to imported crude is the single greatest determinant of production and storage rates for petroleum products at the Ponghwa Chemical Factory. Numerous reports during 2014-2015 have stated that China, North Korea’s largest crude oil supplier, did not sell it crude oil during 2014, a development that would force North Korea’s single operating oil refinery into caretaker status. 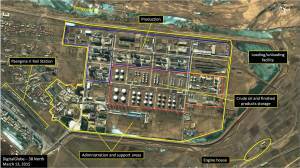 Satellite imagery from 2014 and 2015, however, reveals that the facility has remained operational, though perhaps at somewhat lower levels than in the immediately preceding years, calling into question media reports of an oil cutoff from China. Imagery indicates both rail activity (e.g. movement of rail tank cars and diesel engines) at the factory’s rail loading/unloading facility, the Sojung-ni Storage Facility and the Paengma-ri Rail Station. In addition, construction activity within the factory—for example, the building and maintenance of storage tanks and additions to several buildings—provides another indication that the facility remained operational. Joseph S. Bermudez Jr. is Chief Analytics Officer of AllSource Analysis, Inc., and Sun Young Ahn is a Research Assistant at the US-Korea Institute at the Johns Hopkins School of Advanced International Studies. Yong-yun Kim, “North Korean Chemical Industry,” Pukhan, December 1998,132-143; Central Intelligence Agency, “North Korea: Energy Scene,” July 1987, Declassified; and Central Intelligence Agency, “POL Storage Capacity North Korea, 1982 Estimate,” September 1982, Declassified. Pukhan Sanop 1997, Seoul, February 12, 1997, 230-259. A 1998 ROK report states that the Chinese crude oil for the Ponghwa Chemical Factory was initially transported by vessels from the port city of Dalian to the port of Nampo and then to the factory. This seems at odds with the timing of the pipeline completion in 1976 and the factory coming online in 1978. Yong-yun Kim, “North Korean Chemical Industry,” Pukhan, December 1998,132-143. Yong-chong Yi, “Sungni Oil Refinery in DPRK Recently Shut Down,” Joongang Ilbo, November 11, 1996, 5; Hyon-ho Kim et al., “North’s Steel, Energy Sectors Face Collapse,” Chosun Ilbo, August 22, 1995, 31. 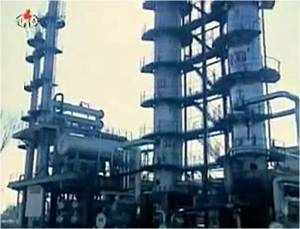 As part of the 1971-76 Six-year Economic Plan the SPA also issued orders for the construction of the Namhung Youth Chemical Complex. For information on the Namhung Youth Chemical Complex see, https://www.38north.org/2014/04/jbermudez041014/. According to a 1987 declassified CIA report, the crude oil received from China during the 1980s was generally heavier than the oil imported from other sources (e.g., Soviet Union/Russia) and was only refined at this facility. Lighter crude oil could be used by either the Ponghwa Chemical Factory or the Sungni Chemical Plant. Central Intelligence Agency, “North Korea: Energy Scene,” July 1987, Declassified. A South Korean study indicates that in the early-1990s the factory has the advantage of not requiring separate desulfurization equipment because the Chinese crude oil is low in sulfur, however, it also lacks equipment for production of light petroleum products such as gasoline and naphtha. Yong-yun Kim, “North Korean Chemical Industry,” Pukhan, December 1998, 132-143. Won-ki Choe, “PRC-North Korea Oil Pipelines Washed Away,” Joongang Ilbo, October 9, 1995, 2. 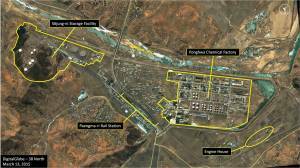 The Sojung-ni Storage Facility is identified as the Paengma-ri Petroleum Refinery in contemporaneous US intelligence reports. Central Intelligence Agency, “North Korea: Energy Scene,” July 1987, Declassified; and Central Intelligence Agency, “POL Storage Capacity North Korea, 1982 Estimate,” September 1982, Declassified. 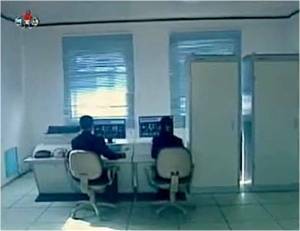 Participants in the computer integration projects were part of the Automation Institute, an office of the Electronics and Automation Designing Branch in North Korea’s State Academy of Sciences. “Production Processes Computerized,” KCNA, October 9, 2002. A number of important spur lines run along the Paengma Rail Line, linking the Ponghwa Chemical Factory, Yangchaek Bearing Plant and the rail station for Kim Jong Un’s Soin-dong villa. The site’s estimated maximum daily output capacity initially stood at 19,000 barrels, and that figure increased to 29,000 barrels with the launch of its second production process line in 1980. Estimates from the late 1990s suggest a maximum production level above 49,000 barrels per day, or 2.50 million tons per year. In the 1980s, the factory was estimated to be capable of holding up to 720,000 barrels of crude oil and finished petroleum products. During the 1980s, these storage and transshipment facilities consisted of an estimated 40 large above-ground and 140 small underground storage tanks with a total storage capacity of 1,203,320 barrels of crude oil and finished products respectively. Central Intelligence Agency, “POL Storage Capacity North Korea, 1982 Estimate,” September 1982, Declassified. Chong-song Ko, Kim Jong-Il’s Secret Weapons Factories, (Tokyo: Bijinesusha, 2001), 19-79. 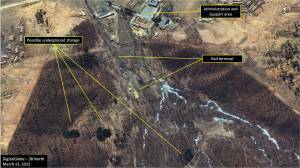 There are reports that suggest there is at least one buried delivery pipeline that transports petroleum products from the Ponghwa Chemical Factory south to a facility in Taedong-gun, northwest of Pyongyang. It is further reported that this pipeline suffered an explosion in June 2007. These reports remain to be confirmed.